One of the better pubs I tried after my visit to the Wenlock yesterday. This is a small pub a stone's throw from Old Street station. I was quite impressed that in addition to the regular beer Doom Bar, they had 2 Thornbridge ales on yesterday - Crackendale & Jaipur. Neither are my kind of beer. But I tried the Crackendale and it was in good condition. Another pub that the owners are looking to do up for the young crowd. A good pub that will soon be no longer. Sad. 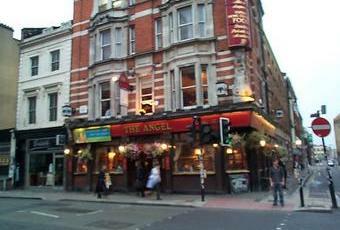 The Angel is a fairly traditional style pub that will fill a gap if you have a gap that needs filling but won�t leave you with any great lasting impressions. The beers are rather mainstream (Bombardier, Pride and Greene King IPA) and not particularly cheap - Bombardier at �3.20 is at the stretching it end of pricing, even for London. The interior is neat and tidy with leather backed built in seating and a semi circular bar but the (I counted 3) plasma screens seem to be a bit too dominating. The patterned windows display Taylor Walker symbols which always remind me too much of Arsenal which isn�t good. The background music was also incredibly dull. There was a bar upstairs but I didn�t feel any great inspiration to explore the place that far. On the whole, a very average place, not one to avoid but certainly not one to make any great effort to seek out. I actually counted four flat screen tele�s and my only gripe with this place was that I couldn�t actually find an area where I could sit and not be in full view of a bright blazing plazma. But that apart I found this to be a decent corner pub. Ale choice was as described by Strongers below and seemed to be well kept. There is a few limited outside tables on the Leonard Street side, but the density of the traffic on the City road doesn�t make this place conducive to enjoying an outside pint.